The Answers Have Been Right in Front of You the Whole Time! 2nd Edition - Rutier than ever with expanded content! Most of us travel well-worn paths with the expressed mission of "breaking out" of the RUT. It seems to be the right thing to do on the surface; who wants to think of themselves as being in such a routine that they cannot, should not, dare not veer off the trail? And You Thought “Escape” Was Your Only Option! Not another self-help book, RUT Management is a fun, but truthful look at the very human tendency to pursue distraction rather than maintaining the focused pursuit of long term goals and dreams. This work addresses the constant conflict between “convention” and “change” in our lives. 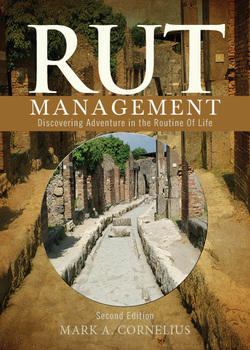 It examines RUT Development, RUT Anatomy, RUT Relationships, and RUT Management as tools for navigating the path through RUT, and for Discovering Adventure in the Routine Of Life.